Cardinal numbers and ordinal numbers are explained here with the help of colorful pictures. There are many steps in a staircase as shown in the above figure. 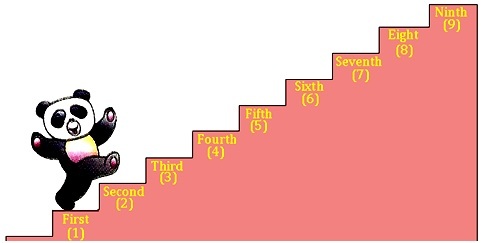 The given staircase has nine steps, i.e., 1, 2, 3, 4, 5, 6, 7, 8 and 9. In the process of climbing up the stairs, we term step Number (1) as the first step, step Number (2) as the second step number (3) as the third step, Number (4) as the fourth step, Number (5) as the fifth step, Number (6) as sixth step, Number (7) as seventh step, Number (8) as eighth step and Number (9) as ninth step. These are also expressed as 1ˢᵗ, 2ⁿᵈ, 3ʳᵈ, 4ᵗʰ, 5ᵗʰ, 6ᵗʰ, ………… etc. Numbers 1, 2, 3, 4, 5, ……, 9, etc., are called cardinal numbers while 1ˢᵗ, 2ⁿᵈ, 3ʳᵈ, 4ᵗʰ, 5ᵗʰ, 6ᵗʰ, ………… etc., are known as ordinal numbers. The cardinal numbers express the quantitative property of the numbers while the ordinal numbers express their order. The cardinal numbers express the number of objects in a collection while the ordinal number always expresses one object. For example, there are five students in a row (cardinal number) and fifth student of the row (ordinal number). While coming down the stairs the ordinal numbers are changed. The 9ᵗʰ becomes the 1ˢᵗ, the eighth becomes 2ⁿᵈ, the seventh becomes 3ʳᵈ and so on. Thus, ordinal numbers are changed in reverse order, i.e., the last becomes the first, the last but one becomes the second, etc. But the cardinal numbers remain the same. Thus, the ordinal numbers indicate the position of an object from the front or back of any given object. Let us imagine that, there are seven boys in a row who are numbered as 1, 2, 3, 4, 5, 6 and 7 from one end of the row. These numbers are called cardinal numbers. Now if we take the position of each boy from boy number (1). The position of each boy is indicated by ordinal numbers. These are from left to right as 1st, 2nd, 3rd, 4th, 5th, 6th, 7th and from right to left as 7th, 6th, 5th, 4th, 3rd, 2nd, 1st. Thus, from both sides the position of each boy may be indicated by ordinal numbers.